In October last year, ExecuJet Europe announced the news that it was moving into Cambridge Airport from January 1st 2012 and would be taking over the Fixed-Base Operation to look after all of its arriving and departing business aviation movements. ExecuJet has taken this step at a very opportune time, for Cambridge is one of just five regional airports in the southeast of England to have been awarded 24/7 status during the time of the Olympics and it is aiming for Gold itself when it comes to delivering outstanding service levels. At the ExecuJet Aviation Group, a multifaceted global customer service management system and shared best practice across the regions ensures that its arriving clients receive the same high level of service in Cambridge as they do worldwide. This network will also be supporting Cambridge in the busy summer period to come as it can draw on its extended FBO network around the world to create the additional temporary roles which will be needed to handle extended traffic and opening hours. The company is used to handling large numbers of aircraft and will be calling on its experience from handling VIP traffic during the annual World Economic Forum in Davos and the World Cup in South Africa in 2010. The move to Cambridge Airport, which is increasingly recognised as a viable business aviation airport, is an integral part of expanding ExecuJet’s UK and European presence. The airport provides an excellent access point to the extensive local industrial, technological, academic and business communities; it has a large runway and is an excellent alternative destination for London-based traffic, especially for travellers coming to and from the US with a location directly on the flight-path that avoids London’s busy airspace. Cambridge Airport, independently owned by the Marshall Aerospace Group, also offers generous hangar space which is extremely scarce throughout the London region. 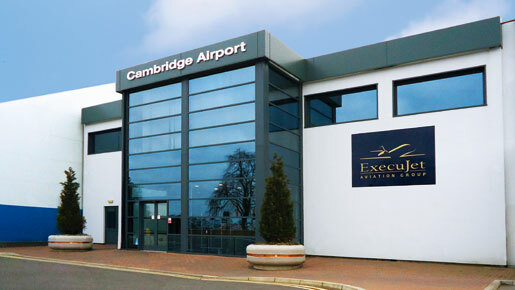 Cambridge Airport becomes ExecuJet’s 10th European FBO and its 16th worldwide. Its strategy to further its expertise in supporting business aviation to private terminals around the world started in 2001 when it established its first base at Zürich Airport. The FBO division of the 20-year-old company is a core part of ExecuJet’s business today, and over the past 12 months ExecuJet has added new FBO facilities in cities as varied as Ibiza, Barcelona, Valencia, Palma, Gerona, Frankfurt, Istanbul, Melbourne and Wellington to its existing network which comprises Berlin, Cambridge, Cape Town, Dubai, Johannesburg, Paris Le Bourget (in cooperation with Advanced Air Support), Zurich and soon in Riyadh. The ExecuJet Aviation Group now boasts operations in six regions – Africa, Asia, Australasia, Europe, Latin America and the Middle East, embracing a worldwide workforce of more than 830 knowledgable, experienced staff. The Group manages 50 business jets in Europe and 150 worldwide and has authorised maintenance facilities certified to work on most business aircraft. ExecuJet provides a diverse range of FBO and aircraft aviation solutions, including specialised and tailored services to accommodate VIP, diplomatic and crisis flights. These include flight planning, arranging overflight and landing clearances, organising in-flight catering and providing a complete menu of ground handling and concierge services including aircraft, passenger and baggage handling, fuel, aircraft valet and hangarage, security, customs and immigration and limousine transfers.